Ivy Scraps Very First Blog Hike--Ivy Trails!! Ok, it's just like a blog train, but Ivy, trails...hikes just goes better than a train. Here is my part of the Hike! I do have a wee bit of the Irish in me, so I enjoyed this theme! Mindy has done a fantastic job of organizing this event for us!!. Sorry, the Blog Hike has ended. Not a member of Ivy Scraps yet? 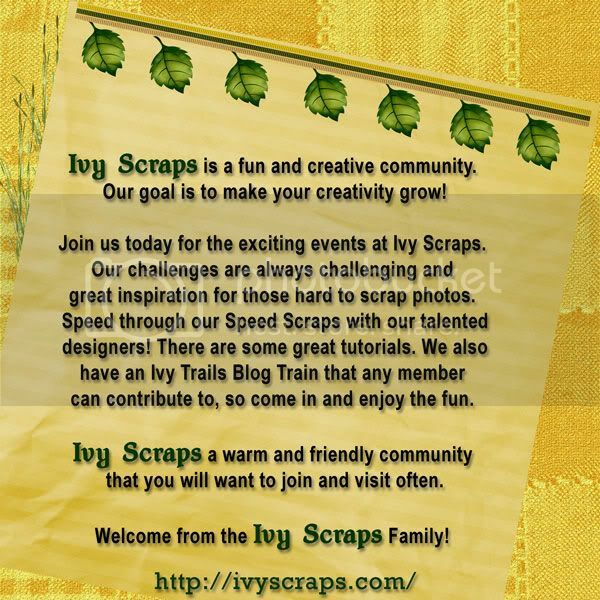 Check out what's going on at the Ivy Scraps forum! Check out all the other designers by following the Ivy Trail. If you get lost along the way, you can always visit the Ivy Scraps Blog to pick up the trail again.